Times Prime is Offering a 1 Month Free Gaana Plus Subscription which is totally Free. Gaana is the one-stop solution for all your Music needs. Gaana offers you free, unlimited access to all your favorite Hindi Songs, Bollywood Music, Regional Music & Radio Mirchi – on your mobile phone, no matter where you are. TimesPrime Get 1 Month Gaana Plus Subscription Free using Given Method Below. 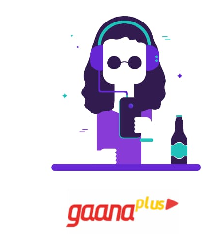 Follow Simple Steps and you will get your Gaana Plus Subscriptions Free! What TimesPrime Offering On Gaana Plus? Usage on up to 5 Devices. 2. Sign up Using your Facebook Login Details. 3. Allow Facebook access and then Enter your Mobile Number. 5. Click on Gaana Plus Offer Page and Subscribe your Subscription for Free 1 Month Usage. 6. You will get a Privilege Member of Times Prime and Your Gaana Plus will automatically Activated. 8. Now Sign in Using that Facebook Profile / Mobile Number which you verified on Times Prime. 9. Select your Language and Music Preference and Move to Profile. 10. You will get Ad-Free 1 Month Gaana Plus Subscription which is Totally Free. Enjoy! !